Passionate poetry, with harmonic chords that evoke sounds of bands like: Analena, Colligere and Asamblea International Del Fuego. 7 songs that refers to other worlds. 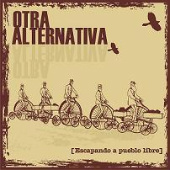 Otra alternativa is a hcpunk band that diffuse from their genuine narrative ideas of vegetarianism and counterculture. To help save on shipping between countries, this release doesn't have a jewel case. It does come with all the parts, so it can easily be popped in an empty case.